While in college, Brian Taylor was looking for a way to add some pop to his favorite snack, popcorn. He started mixing what would later become the original Kernel Season's recipe while living on campus at the University of Michigan. Brian teamed up with experienced flavor experts to perfect the recipes and began developing a seasoning line. 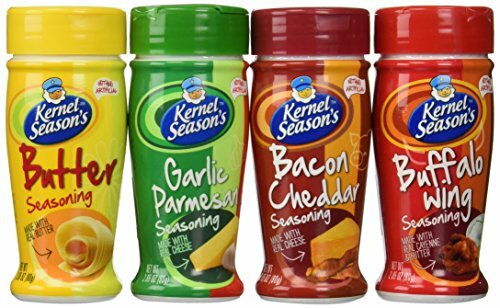 Kernel Season's Popcorn Seasoning popped overseas in 2005, shaking up the flavor in grocery stores, movie theaters and millions of homes around the globe. Kernel Season's is the leader in the popcorn-seasoning category, with even more flavors and on-shelf innovation coming soon! America's Number 1 Movie Theatre Popcorn Seasoning is all natural, gluten free, made with 0g trans-fat, whole grains, real cheese, and Kosher dairy. Made in the USA; Convenient 4 flavor varitey pack, each 2.85 Oz. If you have any questions about this product by Kernal Seasons, contact us by completing and submitting the form below. If you are looking for a specif part number, please include it with your message.